“The ability to work at your own pace and to your abilities enhances the chance for success." Rebecca Lavallee adds, “It is a path that requires an immense amount of self-discipline and commitment, not just from the kids, but from the family as a whole. You have to make it a way of life. When there are no formal commitments you may tend to slack off, or let life and its distractions get in the way. That is not an option,” she says, adding, “If you do not have that kind of commitment or time then you are perhaps better off not attempting it.” Again, well said. 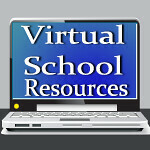 If you can't commit to being there for your child, virtual schooling will probably not work. It's very discouraging for a student to be behind because they aren't disciplined enough to get everything done each day. Unless they are very motivated, and probably in high school, this isn't a skill they have acquired yet. Don't think of virtual school as being a babysitter. Of course, I'm not suggesting parents would leave young children alone while schooling, but being too busy to encourage your child to submit work throughout the day is detrimental to your child's success.